My fellow holiday food bloggers and I are cooking up Halloween treats today. Mine aren't spooky but they're totally holiday ready! Every year, if I happen to find myself in a department store or confectionery shop before the holidays, I come upon a stunning display of caramel apples. Properly coated, festooned with nuts and candy, drizzled with chocolate, they are picture perfect. I want one. I tell myself I will buy myself a treat. I pick one up and look at the price tag. I put it back down. I go to the farmer's market and buy some apples. I'll admit my homemade version isn't quite as picture perfect but it's just as tasty and a whole lot more wallet friendly. A whole lot fresher, too, actually. And since I'm making my own version I can customize to my own taste. The loaded ones in the store have maybe a few too many flavors going on. I want to taste the apple, after all, and they do go so well with peanut butter. And actually, not only did I make a peanut butter caramel, but afterwards it transforms to a chocolate and peanut butter caramel for the final drizzle. I haven't seen that in the store and they don't know what they're missing. Enjoy! Make the sauce by melting the sugar in a pot over a low to medium flame. Do not stir. When the sugar has completely dissolved, remove it from the heat and add the half cup of heavy cream. The mixture will bubble up. Return to a low flame and stir until all lumps are gone. Stir in the butter, peanut butter and salt to taste. Place the chopped peanuts in a shallow bowl. 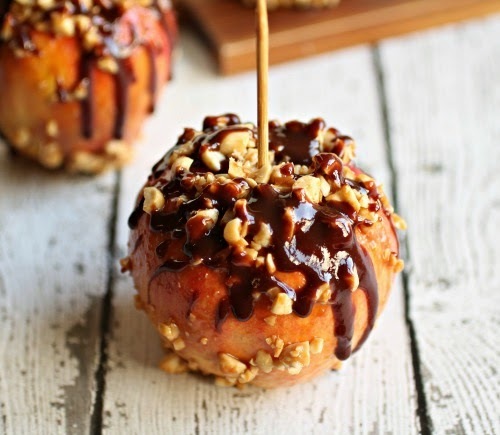 Insert a skewer into each apple and dip into the caramel sauce. Then roll each apple in the chopped peanuts. Set on a piece of wax or parchment paper to set. You will have some caramel sauce left in the pot (which we're going to use so put that spoon down!) Add the chocolate chips and 1/4 cup of heavy cream to the sauce and stir over low heat just until the chocolate has melted. Spoon it over the apples and allow to cool before slicing. You will have some chocolate peanut butter caramel left in the pot. And you'll also have a dish with remaining chopped peanuts that are gooey with peanut butter caramel sauce. These are the cook's treats. Either sprinkle everything over ice cream or use a 1 oz. scoop to form the peanuts into a ball and pour the chocolate sauce over it. Allow to cool and you've got cook's treat candy. Don't tell anybody! Your doctored up caramel apples look incredible, Anita! I haven't made them since my kids were little...as I tend to eat them ALL. I may need an excuse (college fall break?) to whip these up!!! Wow this look incredible and so tasty! 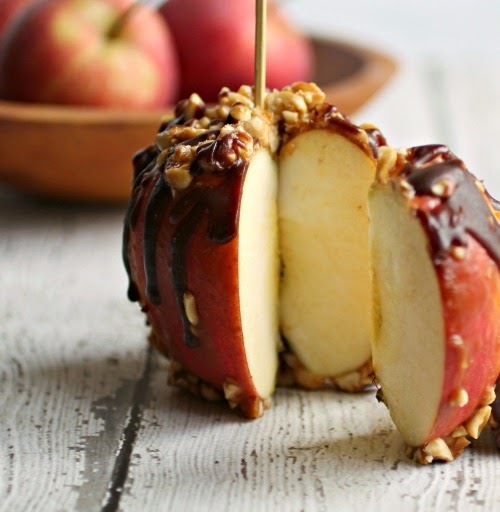 ok so I don't usually LOOOVE caramel apples---but these are a def exception! i love the nutty twist! These are so purdy! I'll take taste over looks any day. I'm going to need one for each hand. Your apples look picture perfect to me. I also pick up the ones in the store and put them back down. Homemade is definitely better for sure. These caramel apples are so much better than the store bought ones and I'm pretty sure they won't ruin my teeth. Plus it has peanut butter and you get a cooks treat! I've never had a caramel apple before (I imagine you're falling off your chair in shock right now but they always looks so glorious 'n over the top delicious in stores. Yours look just as good, Anita and I'm sure they taste waaaaaaaay better! I'm all over the aftermath chef treats too - chocolatey PB caramel and peanuts?! Just pour them straight into my mouth. Those are gorgeous!! 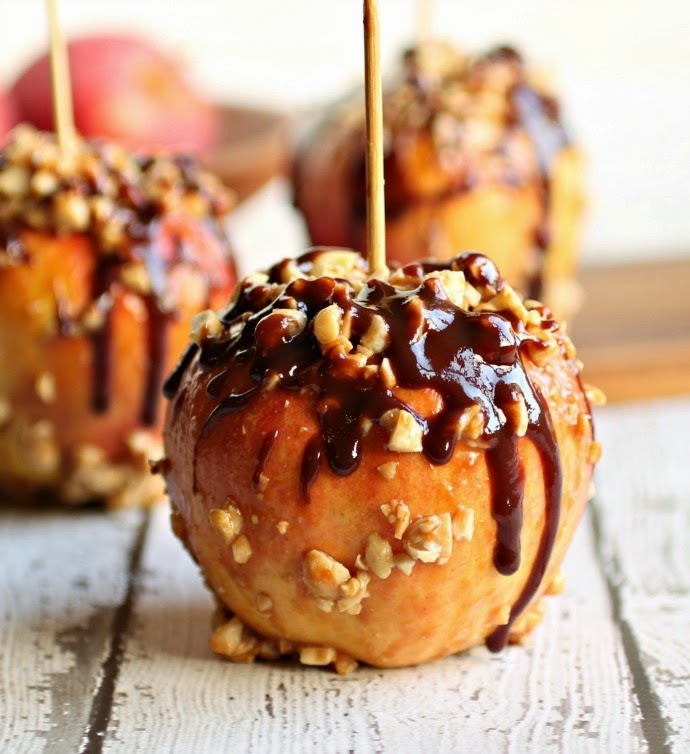 Caramel apples are such a decadent treat - I would love one of these right about now! Ohmigerd! Must. Eat. These. NOW! 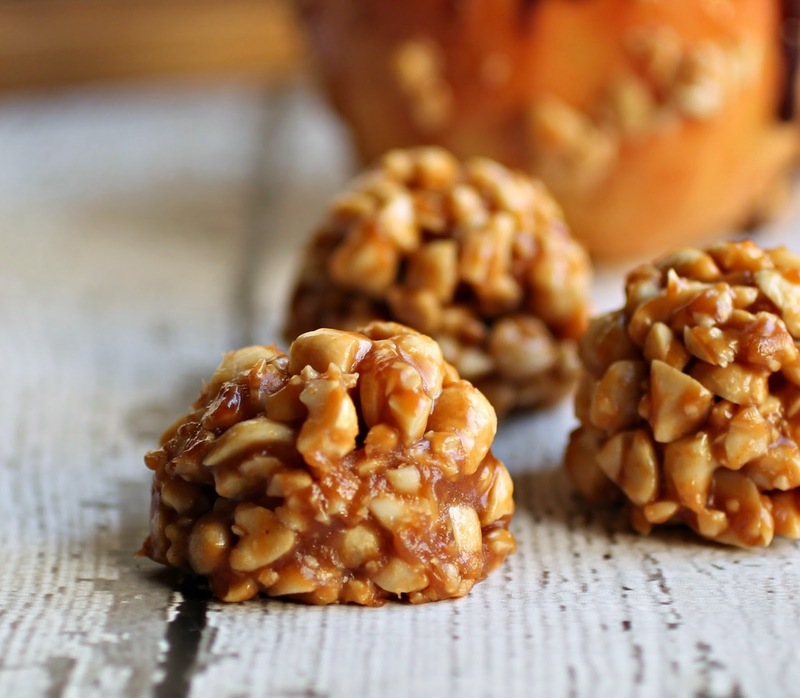 I love homemade caramel apples. You know exactly what's in then and their imperfection makes them taste even better. Peanut butter caramel is genius! Caramel apples are the best, especially when you can get some peanut butter in there too, Anita. Lovely, just lovely! Oooh, yes - these are definitely my type of candy apple!